First printed in 2012, this article highlights our longstanding forecast for Syria. Syria is at war. That country has been experiencing a slowly unfolding civil war for 17 months and counting. More than 10,000 people have already been killed. The Syrian people are intensifying their protests against President Bashar Assad’s government, and the government is fighting back with brutal force. Thousands are dying, and tens of thousands are fleeing the country. Other countries have been pressuring Assad to step down for over a year, and it looks like his regime is reaching the breaking point. But there is something much more significant happening in Syria than just another civil war. Many nations want to see Assad gone, but nobody knows what kind of government would emerge to replace him. The “Arab Spring” has destabilized much of the Middle East and resulted in a range of outcomes and a dangerous level of volatility. Most of the countries involved have lurched toward radicalism. World leaders and news commentators cannot tell you in advance where this crisis will lead. But you can know Syria’s future if you read what we have been writing, based on the Bible, for the past 70 years. What we are seeing right now in Syria is a major biblical prophecy in the process of being fulfilled! What happens in Syria will lead to mighty nations changing course and the foundations of this world being shaken! Did you know that the book of Psalms prophesies the future of Syria? This nation is an important part of the balance of power in the Middle East, and Psalm 83 prophesies that there is about to be a dramatic, violent shift in Syria’s alliances. This will affect many nations, and ultimately lead to an all-out war breaking out all over the Earth! This prophecy reveals the outcome of the uprising in Syria. It also exposes the key involvement of a major outside nation—something we can already see developing. Right now, Syria is Iran’s most important regional ally. But that is about to change. Germany may send forces into Syria. This may seem strange, considering that when the Libyan revolution broke out last year, Germany did not want to get involved. Why is it getting more involved now? Germany has a global strategy, and what is occurring in Syria fits into that strategy perfectly. 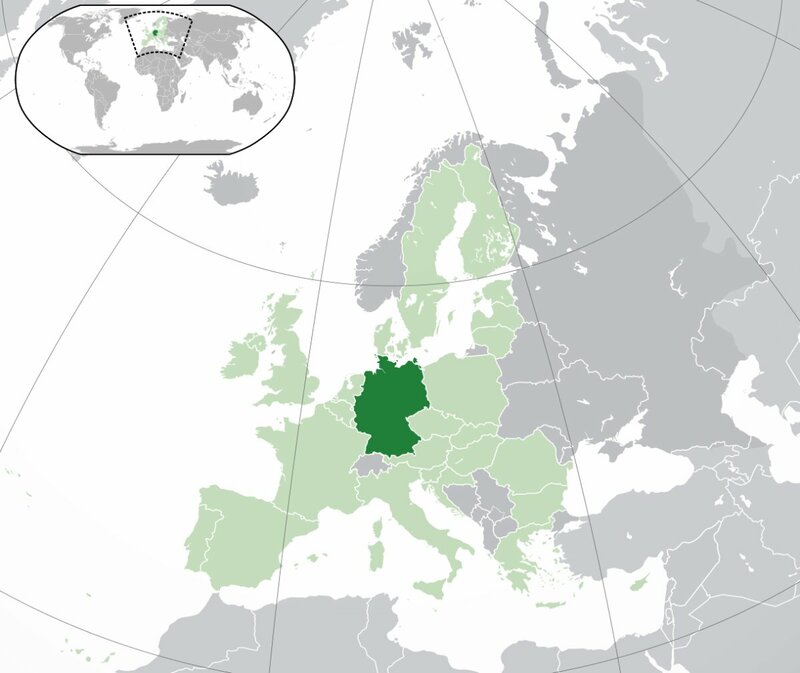 Here is the critical thing to realize: One of Germany’s primary objectives in this region is to develop an axis with Middle Eastern states that oppose Iran. Germany has been stepping up its political involvement and its financial and military investment in Saudi Arabia and other Gulf states, Turkey, Lebanon and Jordan. It has formed solid trade relationships with virtually all these countries, covering many industries from telecommunications to the military. For Germany, Syria’s revolution isn’t about a humanitarian crisis at all. It’s about geopolitics and how Berlin can aggressively advance its strategic interests in the Middle East! America has been too weak to tame Iran and neutralize its allies, but Germany is moving in and filling that power vacuum. The whole world ought to be watching what Germany is doing in the Middle East. Most people are blind to what is going on in Syria, but we have been showing you for 70 years that the Bible prophesies the future—not only for Syria, but for the whole region and the whole world. Biblical prophecy reveals that, very soon, Syria will no longer align with Iran. It also shows that Germany will help cause this split. 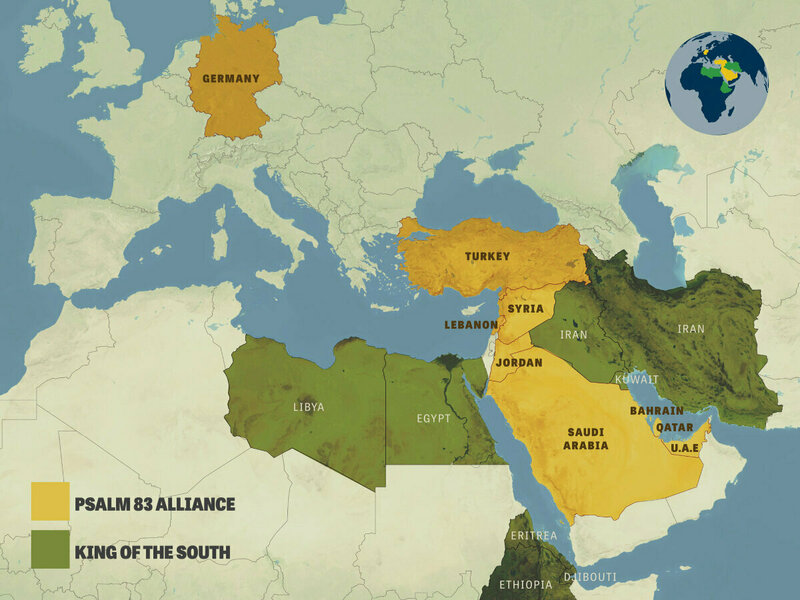 Psalm 83 discusses a multi-nation Middle Eastern confederation that will ally with Germany. This alliance has never happened in history. All of the Bible commentaries will tell you that. But it is happening now. It takes time to build a confederation like that, and it is now well underway. This prophecy involves the same geography: The context shows you that it occurs right in the Middle East and involves some of the same countries. The “king of the north” is Germany, and the “king of the south” is Iran. Right now, Iran is filling the news with its aggressive support for terrorism and nuclear development, and it appears unstoppable. Watch Jerusalem has emphasized how Iran is having its way in many countries and is dominating the region. But Daniel here describes where these current tensions are leading: Germany will utterly wipe Iran out. This foretells of an alliance that will take crafty counsel against God’s people, which is referring to Israel. Daniel 11:40 will unfold just before Psalm 83 is totally fulfilled. Germany and Iran will ignite a spectacular military clash. The German superpower will crush the “king of the south.” Then the Arab nations listed in Psalm 83 will ally with Germany. Daniel 11 shows that the warring does not stop there. Verse 44 talks about “tidings out of the east.” That refers to Russia and China entering into the fray, expanding this world war. That’s right: These events actually mark the beginning of World War iii! That is how important this prophecy is! Some people disregard this prophecy, saying it is just some obscure passage in the Psalms. But God inspired it! We need to prove these things to ourselves. God will help us if we are willing, but we have to work at it and push ourselves. Read the prophecy in Psalm 83: “Keep not thou silence, O God: hold not thy peace, and be not still, O God. For, lo, thine enemies make a tumult: and they that hate thee have lifted up the head. They have taken crafty counsel against thy people, and consulted against thy hidden ones” (verses 1-3). This foretells of an alliance that will take crafty counsel against God’s people, which is referring to Israel. These verses are talking about the modern descendants of the 12 tribes of biblical Israel. Do you know who those are? The modern Jewish state of Israel is only one of those tribes—Judah. In biblical prophecy, “Israel” refers especially to the birthright nations that descended from Joseph: Ephraim and Manasseh. Those descendants are Britain and the United States. Other prophecies show that the fates of these three major nations of Israel—the U.S., Britain, and the Jewish nation—are all aligned. Where Psalm 83 says this alliance is “against thy people,”it means Germany and its Middle Eastern allies are targeting the Americans, the British and the Jews in the Middle East. But notice: There is also a plot against God’s “hidden ones,” which other translations render as treasured or sheltered ones. This refers to God’s faithful people, spiritual Israel. They are embedded right in the midst of all these prophecies to ensure God has somebody He can use to reveal to the world His message about what is happening! You are reading that message right now! God uses His people to show the world what is going to happen before it happens. He uses them to proclaim a message of how these catastrophes could be avoided. Sadly, the world pays them little attention, and it will continue to ignore God’s message until circumstances get a lot more horrific. The president of Iran, Mahmoud Ahmadinejad, has publicly stated that Iran wants to wipe Israel off the map. What is revealed in Psalm 83 is an even more diabolical plot by a different alliance: They want to obliterate even the name of Israel—forever! You must know who the modern descendants of these peoples are in order to understand just how timely and relevant this prophecy is: “Edom” is Turkey; “the Ishmaelites” are Saudi Arabia; “Moab” and “Ammon” both refer to Jordan; “Gebal” is Lebanon. The Hagarenes anciently dwelt in the land known today as Syria. The only one listed here that lies outside the region is “Assur,” which is Germany. Germany is the power behind this alliance! In principle, this is how Germany started World War i and World War ii. It is using the same old modus operandi. Right now, Bashar Assad’s Syria is closely allied with Iran—but this prophecy shows that these two nations are about to split. This will have a domino effect on other nations. These events will really shake this world and dramatically alter the course of history! This prophecy in Psalm 83 reveals a tremendous amount about what we can expect to see in the time ahead—including some dramatic changes! Gebal, modern-day Lebanon, is home today to the Iranian terrorist puppet Hezbollah. We can expect it to also switch allegiance! Even now Germany has naval ships just off the coast of Lebanon. Why should it be so concerned about what’s happening in that part of the world? It is all part of Germany’s global strategy. Watch Germany, and watch the Middle East, and see if this prophecy doesn’t come to pass exactly as the Bible says it will. This prophecy also reveals that the Philistines are with the inhabitants of Tyre. Get a map and you will see that Tyre is in southern Lebanon, the stronghold of the Hezbollah terrorists. Their alliance with Iran is about to be broken, and Germany will be the main cause. The Philistines—or the Palestinians of Gaza and even those in the West Bank—are going to shift their alliance to Germany as well. Iran has recently led Hezbollah and the Palestinians in their terrorist activities. They all share some common enemies—especially America and Israel. But they have some different views in religion and politics, which could cause Hezbollah and the Palestinians to ally themselves with Germany. Also, there may soon be some significant power shifts in Lebanon and Gaza. Edom, or Esau, is Turkey. Turkey has also been allied with Iran, but it too is going to side with Germany in the future! Why? Because it disagrees with what Iran is doing in Syria! While Iran supports the Assad regime, Turkey supports the rebels. Look at the changes that are coming! This is not something we can take lightly. This is world news told to you ahead of time! Just watch—keep track of this. See if these exact events don’t happen. Watch Germany, and watch the Middle East, and see if this prophecy doesn’t come to pass exactly as the Bible says it will. To most people in this world, this means very little. But God prophesied all of it! He spelled it out so that if we just study our Bible, we can understand it all. We must understand it! God has His sheltered ones there, protecting them, and they understand it. These verses foretell a massive shift in alliances among the nations of the Middle East! Events are about to stagger the imagination of many authorities in this world! And God prophesied it all thousands of years ago. Should we believe in the Old Testament? We should if we want to understand end-time Bible prophecy. The Psalms is the only book in the Bible that contains this prophecy. Without Psalm 83, there would be no way to understand these particular events until well after they had snapped into place. This is a most exciting and wonderful prophecy—yet the world understands almost nothing about it. People should understand, because this message has been publicized for them to see for about 70 years by Watch Jerusalem, the Trumpet and Herbert W. Armstrong! Where does this Psalm 83 union lead? It leads to mankind being plunged into the Great Tribulation for 2½ years, and then into the Day of the Lord for a year. But at the conclusion of the Day of the Lord, the Messiah is going to come to this Earth and put down all the rebellion against Him. Finally, He will conquer the nations and bring us peace and joy and happiness forever! That is where today’s events in Syria are ultimately heading. So make sure you watch Syria, and make sure you watch Bible prophecy!